Since I will be off to Kobe Universiade Stadium on Christmas Day, to watch Grampus progress to the semi-finals of this year's Emperors Cup, I will doing Xmas Decorations Black Country Style. In a thrilling encounter before a packed crowd at Kyoto's Nishikyogoku Stadium, Grampus earned the three points in another last-gasp win. After taking a 2-nil lead in the first half, Nagoya seemed to have thrown away two points by allowing Kyoto to claw their way back to 2-2. However, a calmly struck penalty by Frode Johnsen in injury time saw them come away with the three point they needed maintain their championship challenge. Nagoya started the game strongly, with Johnsen forcing Nishimura to push a diving header past the post for a corner. Ogawa's deep corner keep to the back post was met by Magnum, who headed home to give the Red Whales the lead after only 70 seconds. Grampus continued to dominate play during the first half and Magnum extended their lead after 25 minutes. At this point, it looked as though Nagoya would win comfortably, but they were unable to get hat crucial third goal that would have made the game safe. The failure to do so would come back to haunt them in the second half. Sanga boss clearly managed to motivate his team at half time, as they came out showing much more purpose and determination in for the second 45 minutes. Tatsuya Masushima's long throws started to cause problems for an otherwise solid looking defense, but the lack of organization between Nishimura and the back line occasionally gave Sanga hope. Kyoto duly got back into the game when Yanagisawa pounced on a loose ball to fire home from 10 yards. He then pulled Sanga level with a second 10 minutes later when he converted the loose ball after Nishimura has parried a somewhat dubious penalty. This setup a tense, nerve-wracking final few minutes. The game had already been delayed for several minutes, after an injury to Kyoto keeper Mizutani, when another few minutes were added as Kyoto sub Nakatani was injured after a collision between Yoshida and Nishimura as they tried to clear a dangerous through ball. This saw Yoshida fall on top of Nakatani, who was winded enough to require his own withdrawal from the game. Initially, this looked as though Kyoto had a good claim for a penalty themselves, but TV replays show that the main contact with Nakatani came after Maya's collision with the keeper, rather than his initial challenge on Kyoto player. Still, it was a heart-stopping moment for Grampus fans, as the decision could easily have gone against them. The game was decided deep into the seven minutes of injury time, when Frode Jonhsen was obstructed as he attempted to get to a Sugimoto cross. He calmly took his time, not allowing Kyoto any chance for gamesmanship, and fired home the penalty to clinch the win. Numerous media reports suggest that Norwegian striker Frode Johnsen will be leaving Nagoya when his contract expires in January. While this news has come as a shock to many Grampus fans, the likelihood of this happening has been on the cards for some time. Johnsen has clearly settled into live in Japan, and had clearly stated his hope to play another year, hopefully with Nagoya. However, it seems the club has decided not to renew the 34-year old's contract. On the one hand, Frode has been an important part of Nagoya's success this year, and his hard-working, professional approach, an example to other players. On the other hand, he will be 35 next year, and has faded as an influence in the latter half of the season. We can only hope that this decision, means that the club is confident it has a suitable replacement ready to sign (or resign, if say, the replacement were to be Yohei Toyoda.) This must have been a tough decision for the club to make, but one we hope will not backfire on the team and see Johnsen scoring against the club in a crucial match next year. Nagoya forgot their recent struggles in the league to overcome Omiya 2-1 and book their place in the quarter-finals of this year's Emperors Cup. With the Kashima Antlers and Urawa Reds bowing out of the competition over the weekend, this leaves Nagoya with a great chance to reach the final. Even newly-crowned ACL champions Gamba Osaka will not cause Grampus manager Stojkovic to lose much sleep. Unlike Adelaide United, Grampus have been able to give Gamba a good run for their money in both league games this year. Gamba Osaka duly eased past the hopelessly outclassed wallies of Adelaide United to win the Asian Champions League title 5-0 on aggregate. This earns them a berth in the World Club Championship in December. It will be interesting to see how they do against decent foreign opposition. As losing finalists the Aussies also earn a chance to embarrass themselves again. Gamba wrapped up the title after only four minutes, when Lucas pounced on a loose ball after a fierce Sasaki shot was parried by the Aussie's keeper. They then extended their lead 10 minutes later when Lucus was put through one-on-one against the keeper, and calmly clipped the ball past the on-rushing youngster. Once they had two away goals, in addition to the three from the home leg, Osaka eased off but still continued to dominate the game. Despite never needing to move out of second gear, Gamba outshot their opponents 10-2 in the first half and 18-13 overall. Adelaide did not try to play until a brief spell at the beginning of the second half, when they at last showed some gumption and at least made the Gamba defenders do some work, rather than simply fouling them. Cristiano in particular was lucky to stay on the pitch after two deliberate elbows into the face of a defender. Nagoya's poor run of league results continued with a disappointing 1-2 loss to Kashiwa Reysol. This means that the team has not won in the league since mid-September, a series that concluded with four draws and yesterday's loss over their last five games. Incredibly, this has seem the team only drop down to third position and leaves them still only two points off the leaders. Such is the lack of consistency of the leaders in the league this year. This result was particularly disappointing since the team, after a nervy start, controlled most of the game. Indeed they should have taken an early lead when Frode Johsen had sweetly struck goal ruled out incorrectly for offside aft 12 minutes. (A decision so obvious that even NHK could not avoid pointing out that it was a bad call.) This call was an early turning point in the game. Despite the disallowed goal, this saw Grampus seize control of the game, after Reysol had made the brighter start. The team duly capitalized on their improved possession by taking the lead when Ogawa finished off a flowing move just after the half-hour mark. Grampus continued to control the pace of the game in the second half and had several decent chances to extend their lead, but were unable to get that all important second goal. This was to prove costly as the game turned on two minute nightmare 10 minutes from the end that saw Reysol equalize and then grab all three points with a perfectly timed through ball that Popo slotted past reserve goalie Nishimura. Nagoya's next league game is against Kyoto Sanga, who all but secured their J1 survival with a crucial 3-1 win over the Yokohama Marinos. However, Sanga are still not mathematically safe and will be determined to earn more valuable points. It should be a cracking game, if nerve-wracking game. The high stakes of the game, and Kyoto's erratic form, make it difficult to predict the outcome. However, it seems unlikely that Grampus fans will get to see rookie Sho Hanai in this game, unlike the Nabisco Cup game earlier this year. The Gomiuri has this take on the game. Mark and I went to the Expo Stadium with it threatening earlier in the day to be a chilly experience, but in fact the evening turned out to be a beautiful autumn one for watching footie. Point 1) Nishino is probably the best Japanese manager. Gamba are consistently competent. Their skill level is high, they always cover for each other well and their movement off the ball is also usually first class. This has been true for many years and Gamba can be said to be one of Japan's Big Three (with Kashima Antlers and Urawa Reds). Nevertheless, only occasionally do Gamba put on the style. This seems to be mainly a matter of Nishino's temperament. One can criticize Gamba for not playing to their potential. Within the Japanese context, you feel that Gamba ought to be an exciting team like Arsenal or Manchester United; but they often seem content to play within themselves and to have no temptation to show off. This is a pity, because on the rare occasions they put on the style they can be genuinely exciting. So last night was a typical performance: well in control of the match throughout, but not doing more than enough to win comfortably. In fact, it is almost a scandal that two of their three goals followed give-aways by Adelaide United players and the third goal, while quality, was lucky to find its way through a crowded penalty area. One feels that with a sharper attitude Gamba should have won this game about 6-0, without a single if or but. Point 2) Apart from Shunsuke Nakamura at Celtic, Endou has no rival as the best Japanese creative player on the planet. IMHO, Endou is as good as Nakamura--only he has been persuaded by Gamba to stay in Japan or has chosen to stay in Japan. After the Adelaide give-away, with Lucas using the opportunity well and sending Endou clear, there was no way he was going to miss that goal, nor did he, finishing with a typical quality strike inches inside the post. His assist and his disallowed goal also showed his excellent skills. With a player of Endou's quality in the Gamba side, it was suicidal for Adelaide to yield the midfield. The only goal threat Adelaide seemed to pose was from their lively striker after hoofs--there seemed no systematic build-up play at all. Fujigaya in the Gamba goal was hardly tested. Last night's result looks to have been in line with Adelaide being slightly weaker than Melbourne. A very satisfactory result from a partisan view from the Japanese side, but I am left regretting that such a defensive team as Adelaide made the final and that Gamba choose to play so far within themselves. Without ever having to move out of second gear, Gamba Osaka cruised to a comfortable 3-0 over Adelaide United last night to take a big step towards securing their first Asian Champions League title. This first leg of the final was so one-sided that it is hard to see Adelaide managing a home win, let alone overcome the three goal deficit. Indeed the only question arising from last night's performances is, how on earth did the Kashima Antlers manage to lose to such a weak team? Nagoya earned a place in the next round of the Emperor's Cup after a narrow 1-0 win over FC Gifu. While this was another game that highlighted the lack of depth of the team's squad, with the absence of Tamada and Magnum being particularly hard felt, the defense continued to hold their opponents scoreless. This keeps the team in games and provides the chance for last minute heroics, as was the case yesterday, with Maya Yoshida bagging the winning goal in the 89th minute. Due to one of those days when everything goes wrong, I missed the Vissel-Trinita game yesterday. It was another great result for Vissel against the team in 3rd place going into the match, following their away win at Urawa on the 18th--a shock result that reduced Tulio to tears! Two 1-0 wins of enormous value. What a season! With four games to go there is not one team in the League which is more than 12 points away from both the championship and automatic relegation! Vissel on 9th are exactly 10 points off the top and exactly 10 points off Jubilo who are second-bottom! That game against Grampus on August 16, when through sheer stupid gamesmanship Vissel threw away the chance of victory and at the same time threw away the one point they already had, seems to have been a turning point. Vissel have looked much more purposeful since then, scoring a last-minute equaliser away at Gamba in the next match, and from September 27 away against Ardija it's begun to bear fruit. Very important is that Oukubo has regained his focus and form. I went to watch the Vissel-Sanga match at Kobe on October 4--in a game without Gamba, this was far and away the best game between two Kansai teams that I have ever seen. My reaction to the game was: Kansai football has arrived! Three of the Vissel goals were superb, as was, despite a hint of off-side in the build-up, Kyoto's. Sanga were very good going forward and the game was full of neat, imaginative link play from both teams throughout. From start to finish Oukubo was in masterful form. He removed all the doubts that I have had about him this season. Whether he's got over a niggle or just got into a rich vein of form I don't know, but he's been imperious during October, inspiring Vissel to their 4-1 win against Sanga and then their two 1-0 wins against the high flyers, scoring the winner against Oita and becoming joint top Japanese scorer in J1. Obviously there's something wrong with Sanga--they managed to concede two goals after Vissel were reduced to ten men! But it will be a travesty if they are relegated. Although I have to say the standard of football in both J1 and J2 is still improving hand over fist. When Mark and I saw Cerezo v. Thespa, Kusatsu were far superior to what the weak teams were just a couple of years ago. The same is true of Kyoto--with the football they are playing, two years ago they would have been far more than four points off an automatic-relegation position. Obviously Jubilo and JEF are not what they were, but the fact that they are 2nd and 3rd from the bottom with only four games to go tells you how much tougher it is in J1 now than a few years ago. Last year Hiroshima both won the Emperor's Cup and managed to get relegated! Now they are running away with J2, being 22 points ahead of 2nd Yamagata and 25 ahead of 3rd Sendai. Meanwhile, elsewhere in J2 relegated Koufu and Yokohama FC are in 7th and 11th positions--Ventforet are 13 points behind 2nd-placed Yamagata and FC are five points behind Holly Hock, with only the four newest teams, Gifu, Kumamoto, Ehime and Tokushima below them. Yesterday Kazu, at 41 and 8 months, became the oldest player ever to score in the J-League--it was his 150th (it was the equaliser in FC's 2-2 home draw with Ehime FC). Cerezo, in their second year in J2, are eleven points off Montedio--it's as tough down there now as it is in the English Championship. Cerezo are young and inexperienced and don't look like challenging for promotion--but they don't look like a basket case. Fukuoka are also languishing (in 9th). It really is tough now. Gamba have covered themselves with glory in the Asian Cup and eliminated the Reds in the semi-final to go through to the final, winning 3-1 at Urawa after a 1-1 draw in Osaka. Gamba's away form has been good on the whole, but they have stuttered a bit at home--as against Vissel (banzai!). In a game that saw Nagoya earn the point they needed to reclaim second place in the J1 standing, Yokohama Marinos found Seigo Narazaki in fine form as he kept a clean sheet with a series of fine saves to deny the home team. It just goes to show how uneven the standard is at this level. Urawa were in a different class in all areas, yet this was the third year in a row that the Grampus U-18s have got to the last four. (They have reached the final twice.) I hope the Reds try and bring their youngsters through to the first team, rather than signing all and sundry. Their youngsters on show today deserve to be given a decent chance. A last gasp header by Frode Johnsen earned Nagoya a barely deserved point against Tokyo Verdy. Although the Verdy thugs seem intent on fouling their way to J1 survival (as can seen from the game against Gamba last week), they could count themselves unlucky not to have earned all three points against a Grampus team clearly starting to feel the pressure of the title chase. As it is, Nagoya remain level on points with league leaders Kashima, with only six games left to go. Toyoda Strikes Again, Will Grampus Grab Him Back? Montedio Yamagata's Yohei Toyoda scored his second goal since returning from Olympic duty in a 4-1 away win over Yokohama FC. Having scored only two goals in nine appearances before the Olympics, he has now scored twice in the three games since returning to Japan. Yohei was one of the few players in the Olympic squad to make a good impression in Beijing. He scored Japan's only goal of the tournament and at least made his presence felt up front, even if his lack of finesse occasionally let him down. Another come-from-behind victory. Another three points. Another stint at the top of the table. However, winning the league title this year may make it more difficult to strengthen the team, as is surely necessary if the team it to challenge consistently for the title. Apart from the exceptional improvement from youngsters such as Maya Yoshida and Yoshizumi Ogawa this year, the team has also been fortunate not to lose any key players to injury. A stronger squad with adequate replacements in key positions are a priority for next year. At the moment, only the central defence really has the kind of depth needed to sustain a consistent challenge. Japan's women's footballers were edged out of an medal Olympic medal by typically efficient German team last night. Unlike Sorimachi's shapeless wonders in the men's team, the ladies put on a valiant display throughout the tournament. They were only bested by the US, and that only after they made the mistake of taking an early lead in their semi-final match, only after which did the Americans really start to play. Germany have their goalie to thank for the win, since her two excellent saves in the first half kept them in the game and enabled them to get the barely deserved victory. In Euro 2008 Spain were able to claim a win against an equally undeserving German team. Despite playing the more attractive and entertaining football, Nadeshiko Japan were unable to do the same. The Daily Gomiuri and the official Olympic site also have reports on the game. As has often been the case this season, Nagoya started well, putting their opponents under pressure in midfield and using rapid passing moves to keep possession themselves. Kobe were unable to cope with this pressure during the opening 45 minutes, and fell behind after Ogawa tucked home an easy chance after some good work by Keiji Tamada on the left. Although Grampus controlled the first half, and much of the game, the team is still struggling to convert this into a more comfortable lead. This almost proved the team's undoing as Vissel competed more effectively in the second half and even looked they might steal a winner for a few minutes after Leandro scored an equaliser with 10 minutes to go. Fortunately, the same player helped Nagoya earn the three points when his attempt to take a FK quickly backfired and gifted Grampus possession. Nagoya rapidly advanced up field and Ogawa bagged his second easy chance of the game. Now I am sure our friends at the Rising Sun News and JSoccer will bemoan the performance of referee Murakami, who was determined to allow the game to flow. However, as we saw in Beijing, players expecting to earn fouls simply because they crash to earth every time they are tackled puts them at a disadvantage when they come up against a more experienced ref. Now, Murakami's determination to let the game flow meant that there were a few tackles for either team that one would have expected to be penalised, it made for a fast-paced entertaining game. It also favoured Grampus since they were the team that played with more rhythm and style. This left Vissel fans wailing about the bias towards the visiting team. But I would rather see referees playing the advantage than constantly stopping the game. Japanese players need to learn to stay on their feet, rather than copying the theatrical diving of some South American teams. Japan's men's team bowed out of the Olympic after losing 2-1 in their "must win" game against Nigeria. However, all is not lost for Japanese football as the women's team put in another good performance and trounced Norway 5-1 to progress to the last eight. Although the game was tied 1-1 at half time, Japan had looked the better team in the first half and quickly took a decisive 3-1 early in the second after deflected shot from Ono and an own goal effectively sealed the team's progress to the next round. Further goals by Sawa and substitute Hara completed the victory. The over optimism evident in some quarters after the two recent warm-up games against Australia and Argentina was cruelly revealed as Japan crashed to a 1-0 defeat against the USA last night. Japan had several opportunities, including a glaring miscue in front of an empty goal by Tokushige, but were unable to convert them. Unless manager Sorimachi, or the players themselves, show some guts and ambition, they look likely to crash out of these Olympics the way Yamamoto Japan did last time. Typically, the manger seemed to blame the players for not producing their best, rather than acknowledge his own failure to prepare them properly. As always, the problems were up front where Morimoto was ineffective. Japan's forward line looked much more likely to create problems once Yohei Toyoda and Tadanari Lee came on in the second half. Indeed Toyoda should probably have earned a penalty after a tussle with a defender, but he threw himself down rather too theatrically to be convincing. The US also had a much more convincing claim turned down earlier in the game. If this group fails to even progress to the knockout stage, as seems likely, it will make this the "Wasted Generation", an even bigger indictment of the manager than the inept "coaching" of Yamamoto"s "Valley Generation". In further proof of the progress under rookie manager Stojkovic this year, Nagoya confirmed their place in the Nabisco Cup semi-finals with a 1-0 home win over JEF United. This game them an aggregate 2-0 win over the two legs and sees them join S-Pulse, Gamba and Trinita in last four. With only Gamba, of the top teams, still in the tournament, the Red Whales have a great chance to pick-up some silverware later this year. Although JEF fielded a packed defence, Grampus made the breakthrough midway through the second half when gentle giant Masukawa headed home from a corner. Kashima earned a decisive 4-0 win at Nagoya. In what was otherwise a fairly close game, the Antlers' extra bit of class and experience saw them capitalise on their chances while Grampus failed to score from several good opportunities. (Grampus out shot the Antlers 17 to 9, but did not make any of them count.) In terms of closeness of the contest, this was similar to the 1-2 home loss to Gamba earlier this year. In terms of the score, it was like Nagoya 5-0 win over Kofu a couple of years ago, when a close encounter was not reflected in the score line. However, a 4-0 loss at home is a disappointing loss no matter how many chances the team created, and poses the first real test of Stojkovic's ability to get the team back on track after a bad loss. It also exposed the lack of depth to the squad, with the absences of Magnum, Nakamura and Takeuchi being keenly felt. Kashima got off to a lively start, and were soon 1-0 up when Marquinhos was quickest to react to a loose ball that Grampus allowed to get through to the six-yard box after four minutes. Nagoya did not really get going until a good through ball from Johnsen after eight minutes proved just a touch too strong in the wet conditions and allowed Sogahta to get to the ball just ahead of Tamada. Former Antler Fukai then went close with a couple of efforts before Nagoya appeared to draw level after 24 minutes, when Johnsen slotted home a cross from the right. However, Johnsen had drifted offside in the buildup and the referee's assistant spotted this and, in rare case of them actually drawing the ref's attention to something, the goal was ruled out. Shortly after this incident, Kashima went further ahead when a wickedly dipping shot from Ogasawara beat Narazaki from 40 yards. In addition to a handful of half-chances Grampus had an excellent opportunity to get back into the game later in the half, when Tamada was brought down by a clumsy challenge by Inoha. (Although the yellow card he received in addition to conceding the PK seemed a bit harsh.) As if to prove the this would definitely not be Nagoya's day, Tamada blasted the penalty over the bar. This sense of inevitability was reinforced when Sogahata made a finger-tip save to stop a Bajalica header just before half time. Unlike the first half, Grampus made a much brighter start to the second period, with Tamada just filing to control his shot from a sharp cut-back by Ogawa in the opening minutes. Johnsen saw a volley from a tight angle go over the bar, and Tamada saw another good effort saved by Sogohata as Nagoya pressed to get back into the game. However, they were unable to make their efforts count and were further punished by a stunning goal from Denilo and cool finish by Marquinhos after a surging run down the right by Uchida. So, an entertaining game ended with a decisive win for the visitors who showed the difference in class between the top two or three teams (Gamba, Antlers and Reds) and those hoping to challenge for a title. Although Grampus competed well for much of the game, the extra precision and composure of the Antlers saw them highlight the difference that this can make. For manager Pixie, the challenge will be to pick the team up again after this setback. Fortunately, if the players focus on the fact they did indeed create the chances to score, and can quickly regain the sharpness they showed before the break, the team should soon be back to winning ways. The J.League resumes J1 games later today, after a one-month hiatus for Japan's World Cup qualifiers. With Gamba Osaka and the Kashima Antlers winning their games in hand on Wednesday, the chase for the J1 title is nicely poised with both these teams now only four points off the pace. Second placed Nagoya have an instant test of their credentials, taking on Kashima at Mizuho Stadium. Now that we are 13 games into the season, opponents cannot make excuses about being surprised by Grampus' style of play. On the other hand, the breaks has given manager Stojkovic time to develop that style a bit more. It will be interesting to see how good a game the team can give Kashima this evening. So far this season, three main factors have contributed to the team's best start to a season. The first, of course, is Pixie's ability to get the team playing a clear style sooner than we had a right to expect. The second factor is the great progress of young stars Maya Yoshida and Yoshizumi Ogawa. Both look class players who should ensure the team continues to enjoy success for the next several years. Finally, the midfield players, especially Naoshi Nakamura and Keiji Yoshimura have been working their socks off and pinging the ball across the pitch more quickly than the somewhat ponderous build-up we saw last year. While the summer heat is likely to reduce their ability to pressurize the opposition quite as effectively, the success of the strategy should help the team apply it more evenly. Bring on the Antlers and let's see how much progress we have made. Yes, the flaming pink flamingos of Cerezo looked pretty dire last night as they crashed to a 1-2 defeat to TheSpa Kusatsu at Nagai Stadium. This loss sees Cerezo surrender second spot in J2 to Yamagata Montedio again, on goal difference, and revealed that they are simply not ready for a return to top league yet. Cerezo Pete and I went to see Cerezo vs Thespa last night, and it was not a pretty sight. Both teams were awful, and found it hard to pass to their own team mates if put under any kind of pressure at all, but Kusatsu were worthy winners due to their more lively approach. It is hard to see Cerezo justifying a return to J1 based on this performance, which was even worse than their unconvincing victories over Gifu and Kumamoto earlier in the season. Even Geremano, who had looked Osaka's best player in the pervious games could not make any impression, and as for Ale, the Brazilian embassy should revoke his passport before he does any more damage to their country's reputation. ... are available on the internet at footytube. Grampus defender Maya Yoshida and former Grampi, Keisuke Honda put in good displays in Japan U-23's 0-0 draw with Cameroon U-23s. Yoshida looked solid against strong, tall opponents, whilst Honda saw a free kick whistle past a post and setup one of Japan's best chances in the second half; a quickly released pass to send Lee clear through the middle. However, despite the team putting in a good performance against a useful-looking Cameroon side, this game still leaves manager Sorimachi with a few headaches. As has generally been the case for this team, the defense looked solid, and the midfield displayed talent and promise without managing to gel to become greater than a collection of talented individuals. As always, the problem is up front with Morimoto and Ri both failing to score from good chances. Morimoto, in particular, being guilty of putting an easy chance wide of the post with the goal at his mercy. This means that despite a good performance, Yoshida cannot be sure of a place in Beijing. After-all, he will still be only 23 come the London Olympics in 2012, and the team needs to improve its attacking options, not its defense. I would certainly expect to see Sorimachi use his over age quota to bolster the attack with the likes of Yoshito Okubo etc. 18-year-old rookie Sho Hanai sets up dramatic injury-time winner as Nagoya come from behind to send Kyoto out of the Nabisco Cup. A dramatic start, in which Sanga took the lead in the first minute, is matched by an even more dramatic finish as Grampus equalise with five minutes to go, and score the winner three minutes into injury time. The dramatic conclusion to this game was tough on Kyoto, who had looked set to keep their faint hopes of qualification alive until Grampus substitutes Hanai, Niigawa and Tsuda changed the flow of the game. Sanga got the perfect start, when a punched clearance by Nishimura fell to Yuto Sato, who blasted home from the edge of the box with less than a minute gone. While hardly dominating, Kyoto looked the more organised and enterprising and forced Nishimura to make amends for his poor clearance with a couple of good saves to keep Grampus in the game. However, the introduction of Hanai, Niigawa and Tsuda in the second half changed the tone of the game. Maki had already seen a close-range effort come back off the post before he blasted in the equaliser in the 85th minute. Grampus U-18 graduate, Sho Hanai, then helped complete the turn around with a thru-pass to put Tomohiro Tsuda clear and the striker calmly slotted home the winner to send the travelling Nagoya fans into wild scenes of celebration. For Grampus, this was a significant win in that it not only guaranteed their qualification for the knock-out stage, it also gave several young players valuable experience in a winning cause. However, it also revealed that Miki and Matsukawa are no substitute for Yoshida and Bajalica at the heart of the defence. It also indicated one of the tests awaiting manager Stojkovic, that is strengthening the squad so that the team is likely to sustain a challenge for the league title. Dramatic though this win was, the team's struggle to get into the game until fresh legs were introduced, showed that the squad lacks depth of quality. While rookies Sato and Hanai look promising, with Hanai have several useful touches during his brief appearance, others were less impressive. Grampus move three points clear of Vissel at the top of Group A in Yamazaki Nabisco Cup qualifying, with a comfortable 4-2 win over Urawa at Toyota Stadium. The win puts them in with a strong chance of clinching qualifying for the knock-out stage next week, when they travel to Kyoto. Goals by Ogawa, Sugimoto, Maki and Tsuda mean that Nagoya is the only team in Group A with a positive goal difference. After a lacklustre first half, Nagoya come out firing on all cylinders to earn a 3-1 away win in Sapporo and go into the mid-season break level with Urawa at the top of the league. This weekend was a good day for the J.League, with Gamba Osaka downing the Urawa Reds in Urawa to blow the championship race wide open again. Even if Osaka needed a bit of help from the officials, who were conned by Gamba's Bare quickly taken throw-in, even though it should actually have been an Urawa throw-in. Nevertheless, although the officiating left the league with egg on its face again, the results leaves the title race nicely poised. The league goes into its one-month-long break with Urawa and Nagoya level on 26 points at the top and with FC Tokyo three points back in third. Although kashima and Gamba lie seven points off the pace, they do have a game in hand, and should still be able to mount a challenge for the title come December. For Grampus, the break gives players like Nakamura and Yoshimura, who have been working their socks off, a chance to recharge their batteries. It also gives improving youngsters Yoshida and Ogawa a chance to absorb some of their experiences from the early games. VVV Venlo and Keisuke Honda sink to a 2-0 loss and a swift return to the second tier of the Dutch league. Honda has been reported as saying he would like to stay with the team, even if they went down, and playing in a lower division certainly did not do Daisuke Matsui any harm when he moved to France. It would give Honda a chance to adjust to the more physical nature of European football, while his skill should be more decisive and give him a chance to integrate with the team more thoroughly. However, financial considerations may see him move elsewhere. It will be interesting to see whether footballing reason or the interests of agents' commissions prevail. Despite the brief gap since the last game, Grampus control the opening half during which Tokyo had no answer to the pressure and quicker movement of the visitors. During this period, Keita Sugimoto burst through the middle to latch onto an Ogawa ball into space and clip the ball past the advancing keeper and into the net. Although Nagoya remained comfortably in control throughout the half, they were unable to get a second goal that would have allowed them to ease off the pace a little. While the home team improved in the second half, they still did not look like a team that will be challenging for the title come the end of the season. Nagoya on the other hand used good team work and timely substitutions to maintain their lofty position, the win taking them briefly back to the top of the table. Of course, Urawa were playing the hapless JEF so the Reds were to reclaim top spot later in the afternoon. While Grampus still do not have enough depth to mount a sustained challenge for the title, I do not expect them to drop too far off the pace and summer signings might just bring them up to a level that could challenge for a top three spot. Gamba Osaka and Kashima Antlers have ACL games on Wednesday, so there are two less games than originally scheduled for today. Former Grampus midfielder Keisuke Honda helps his team earn a 1-0 win at home in the play-offs to decide promotion/relegation to the Dutch top division. AFter losing the away leg 0-1 earlier in the week, this means that Honda and company will play a third game this Thursday. It now looks probable that if VVV fail to survive, they may be forced to allow Honda a transfer, which looks like to may be to Portsmouth in the English Premier League. As expected, the J League applied liberal coatings of whitewash when it came to "investigating" Yuichi Nishimura's verbal abuse of players. Nishimura, who was roundly jeered when announced as the match official at Toyota Stadium on Saturday, was accused of telling a player to "drop dead" during last week's game between FC Tokyo and Oita Trinita. Despite reports that other players confirmed the referee's verbal abuse, in the absence of undeniable evidence the bureaucrats have sided with one of their own. Maybe fans should just chant "Die, Die, Die" each time Nishimura takes charge of a game from now on, since Gaptain Gormless seems nervous about all the fuss. Gamba Osaka leave Toyota Stadium with all three points in an entertaining game i front of 34,000 fans. Two goals from the ever dangerous Bare, ether side of an Ogawa special, saw the Osaka team earn a deserved 2-1 win. Although Gamba got off to the slightly better start, it was Grampus that first forced a 'keeper to make a serious save. Matsuyo being forced to palm away a good effort by Tamada, with Osaka fortunate to see the loose ball cleared by a defender before Johnsen could pounce. However, both teams continued to probe with some quick passing while both teams were quick to try and put pressure on their opponents. This was were Gamba's extra experience and class showed, finding their team mates with one-touch passes under pressure more consistently than the home team. Having said that, they needed to be because Nagoya still managed to create several opportunities and were far from outclassed. It took a typical bullish run by Bare to open the scoring, when he latched onto a through ball through the middle and took advantage to a moment's hesitation by Bajalica and a rare slip by Yoshida to see a deflected shot wrong-foot Narazaki after 24 minutes. The young defender seemed overly harsh on himself, looking very dejected after the goal, but soon bounced back to his normal self. Thereafter, Bare found it much harder to create any space when paired one-on-one with Yoshida. A harsh lesson, but one that can only serve the future national team defender well. While Nagoya probed and prodded to create the equalizer, they lacked the finesse to prize open the Osaka defense. This took a 20-yard screamer from Ogawa eleven minutes later, the ever improving midfielder collecting a pass from Nakamura and unleashing a rising shot that left Matsuyo flailing at thin air. Both teams continued to play neat, attractive football but the only other real chance came towards the end of the opening half when Nakamura free kick was well saved by the Osaka goalie. Although Gamba had looked the have a slight edge in the first half, the second half was a much more even contest, with Grampus competing on an equal footing in nearly all areas of the pitch. Unfortunately, Bare was again to prove that on his good days, he is almost impossible to tame. But first, speedster Keita Sugimoto came on for the visibly hobbling Tamada early in the half and almost immediately created a chance when a cross-shot proved just a bit to hot for Johnsen to deflect into the bottom corner. The big Norwegian's touch slipping just the wrong side of the post. A couple o minutes later saw another golden opportunity go begging, when Sugimoto burst through from the right but saw his fierce shot clip the cross-bar. Both teams traded half-chances, with a Yasuda shot comfortably saved by Narazaki and a Johnsen effort in front to goal fortuitously ricocheting off an unsighted defender. Unfortunately for the home team, Bare was to clinch the three points for the visitors. The Brazilian marksman beating Narazaki at the near post, with a sharp turn and shot from a narrow angle after the 'keeper had steered him a away from goal after a through ball from Endo. Although the loss, the third in a row, is worrying, the style of the Magoya performance and the fact that they are still only one point off the pace, show the improvement from last year. Provided the team does not dwell on the results and considers it position, and the fact they are now able to compete with the best teams in the league over a full 90 minutes, they should soon be back to winning ways. For Gamba this was a well-earned three points from a skillful and hard-working performance, that saw new recruit Lucas start to look an asset to the team. Rather than trying to compete with Bare and Bando for attention at the front, he dropped back into a more creative position and was instrumental in some of the team's best moves. In a game that saw both Yoshimura and Yoshida rested, Nagoya got off to a slow start that saw them trailing 1-2 at half time. Although they improved in the second half and had several chances to get an equalizer, they could not make them count and slipped to another defeat. Tokyo field their experienced veterans to send Nagoya to its first league defeat at rain-soaked Ajinomoto Stadium. Verdy started brightly, exerting some early pressure and the first real chance of the game, when Diego sent a glancing header wide from a corner after five minutes. Tokyo continued to hold the edge for the opening spell and it was not until Ogawa whipped in a snap-shot after 15 minutes that Nagoya started to get into the game. Grampus then looked the slightly better team for the middle of the half, with Tamada seeing efforts parried by Doi and deflected off-target by a defender. However, Verdy closed the half well with a Tsuchiya back header leaving Narazaki scrambling and Diego seeing a shot deflected wide. The second half opened with Verdy again looking the brighter team, and a rare slip by Maya Yoshida who misjudged the bounce of a throw-in and allowed Diego slip in and slice a shot wide of Narazaki's right post. Diego, who looked a constant threat, duly opened the scoring in the 55th minute when a shot from inside the area crept inside the far post. The goal saw Stojkovic bring on Sugimoto for Yoshimura. While this showed attacking intent, the wet, slippy conditions probably did not best suit Sugimoto whose speed really needs a pitch with sure footing. Not surprisingly, Sugimoto failed to make his usual electrifying runs, although he did get in one diving header that sailed over. Verdy's 18-year old rookie Hiroki Kawana also failed to master the overcome conditions and give the home fans a glimpse of his dribbling skills. But he was able to sneak in to head home a free kick after some lag marking from the Grampus defense after 72 minutes. Although Nagoya pressed forward for a goal, substitute Masaki Fukai unluck to see a close range effort cleared by Doi, they were unable to close the gap and Tokyo earned three valuable points. Although the 2-0 score line exaggerates Verdy's advantage, Grampus fans cannot complain since our own results against Urawa and the Marinos were similarly misleading, and Tokyo were worth the three points after an aggressive home performance. The good start to the season will have given the Nagoya players confidence and believe in the Stojkovic system, and it is up to them to show that they can bounce back and continue to play the effective football they have displayed this season. Opponents will start to counter Grampus' style, but only the top few teams are likely to be able to do so effectively. Elsewhere in the league, Kashima's draw at Omiya and Gamba's dodgy defense ensured that Grampus remain in top spot. Maintaining their unbeaten start to the season, Nagoya come from behind to down a spirited, but winless JEF United, 3-2 to go three points clear at the top of J1. This was one of the first games in which one of the weaker teams in the league tried to counter Nagoya's style of play. In the first half they succeeded and took a deserved 2-1 lead, but Grampus were able to adjust at half time and gradually exerted control over the game in the second. Despite the goalless score line, this was a top-notch game with chances for both teams to claim the three points. A draw, however, was a fair reflection of the game as this was a much more even contest than last week's encounter between Urawa and Kashima. On this showing, both teams should give a good account of themselves in the Asian Champions League (ACL) and are likely to be the leading contenders for the J1 title come the end of the season. This weeks results see Grampus continue to lead the pack, while FC Tokyo have moved up to third. This means, that for the time being at least, the table sees a couple of fresh faces alongside that of the usual candidates Kashima, Osaka, Yokohama and Urawa. How long Nagoya and Tokyo can maintain their high positions remains to be seen, but neither team should falter as badly as they did last year. Osaka eventually manage to scrape past J2 newcomers Kumamoto, scoring late in the game to "earn" all three points. Despite looking the batter team for most of the game, Cerezo found it hard to create clear-cut chances against a solid, organized Roasso defense. This was a scrappy game, especially in midfield, with Osaka failing to make their technical superiority count. As it was, Kumamoto could easily have taken the lead after seven minutes when Nakayama was put through on goal. Fortunately for the shocking pinks, Yamamoto was equal to the task of beating away the shot. Thereafter, Roasso struggled to create many clear chances but occasionally threatened when Takahashi and Nakayama were able to find space. It was the lack of ideas and quality from the home team that was most worrying to see. The only players to show any class were youngsters Kagawa and Kakitani, and although both showed promise they were not able to bring to life a fairly dull game. Cerezo only showed any urgency to win the game once two more youngsters Sakemoto and Shiratani were introduced in the second half. Indeed it was Shiratani who headed across goal to give Geremano the simple task of nodding home the barely deserved winner in the 84th minute. While Kumamoto will struggle to escape bottom position this year, the experience and skills of former Japan international Uemura and the on-loan "Naniwa-no-Gon" Nakayama may prove decisive against fellow strugglers. As for Cerezo, the only positives they can take from this game is that they managed to get the three points and promising performances from youngsters Kagawa and Kakitani. However, it is hard to see them making a quick return to J1 based on this scrappy game. Nagoya continued their winning streak, downing Vissel Kobe 2-0 at Mizuho Stadium to go top of Group A after three games. In a game in which Grampus dominated possession, Keita Sugimoto and Toshiya Fujita scored in the second half to give the home team a comfortable win after a tough opening 45 minutes. Grampus fielded a team that was only slightly "weaker" than the lineup that has started most of the league games this year; Yoshida, Nakamura, Yoshimura, and Johnsen all being rested. However, their replacements were not unexperienced rookies but the likes of Masukawa, Fujita, Yamaguchi and Maki. In particular, it is good to see Maya Yoshida given a day off. Although clearly good enough to keep his place in the team, the youngster needs the occasional chance to relax and digest some of the things he is learning. This chance to get away from the constant pressure of playing in the top team was not afforded Keisuke Honda, who spent most of last season looking somewhat jaded after three years of almost constant appearances for Grampus and the Japan U-23s. The Japanese football magazine Weekly Soccer Digest features s section on Pixy Grampus this week. 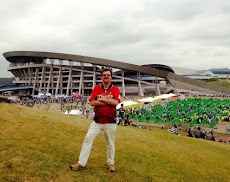 Predictably is compares the current Grampus with Arsenal, but does include a reasonable analysis of the team's success. i.e. The main difference this year is that the team is not only organized, but also has an effective system that both the manager, and more importantly, the players understand. The issue also features a Tetsuo Nakanishi interview with Stojkovic and an article on Tamada. Former Grampus striker Atsushi Katagiri gets his J2 goal account started with a brace in the 1-5 demolition of Avispa Fukuoka. The win sees the newly promoted Gifu rise to second place, on goal difference. While I expected them to be able to hold their own in J2, given the number experienced players they have in their squad, this level of success is a bit of a surprise. This game saw Nagoya repeat their feat of catching the home team napping in the first half, playing aggressive, confident football that allowed them to control the opening 45 minutes. Ogawa opened the scoring, racing in to slot home a slide-rule pass from Keiji Yosimura after some good work by Tamada in midfield. Grampus continued to control the game until half time, and Shimizu only got into the game in the second half. However, they were unable turn their slight improvement into a goal, and Sugimoto scored for the second game in a row to seal the points. Nagoya Grampus opened up a three-point gap between themselves and Gamba Osaka in third place after taking all three points from Yokohama Marinos. Despite the identical 2-0 score line, this game was not as comfortable as the game against Urawa, where Grampus were well worth their half-time lead. The Marinos looked slightly the better side individually, but were rarely able to pierce the well-organized Grampus defense. Although they out-shot Nagoya 17-9, many of the Yokohama efforts were from outside, or near the edge of the box. Given the height of the Marinos defense, all being over 1.8 meters tall, it is hardly surprising that both goals came from passes to feet. FIrst Norwegian striker Johnsen tapped home a wicked Ogawa cross-ball from close-range in the first half, and Keita Sugimoto sealed the win with a quick break away that saw him round the keeper to blast the ball into the empty net after 89 minutes.